Well, there is none, not yet anyway. And if it were up to Boeing, this aircraft would have a long and successful career in the Air Force and the Navy as well as numerous foreign countries. 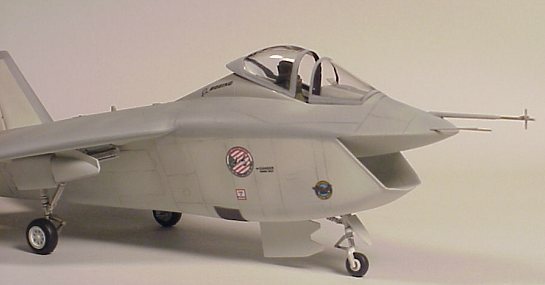 The U.S. Government is banking on this and/or the Lockheed X-35 to supply the Military with the fighter to serve well into the 2000's. Built in two variants, the 32A and the 32B, Italeri's kit represents the A version, for normal carrier and land operations. The 32-B has Short takeoff and Landing capabilities, and from what I could see from the videos has a slightly different front end and of course the pivoting 'Harrier' nozzles under the wing. Italeri has done it again. First with a stealth and first with the X-32. Great molding, no flash, lots of injector pins and fine recessed scribing! All surfaces look to have a very fine sandy finish, very fine and will not pose a problem. The molding of the fuselage is split horizontally and is a work of art. First off is the front office, it could use a better ESCAPAC seat, the one supplied is a bit simplified. I managed to put in a True Detail version. I'm not sure if this cockpit could use an F-16 or similar cockpit replacement, not really building these Modern aircraft at all. But if detail is your bag, then experimentation is going to be in order. 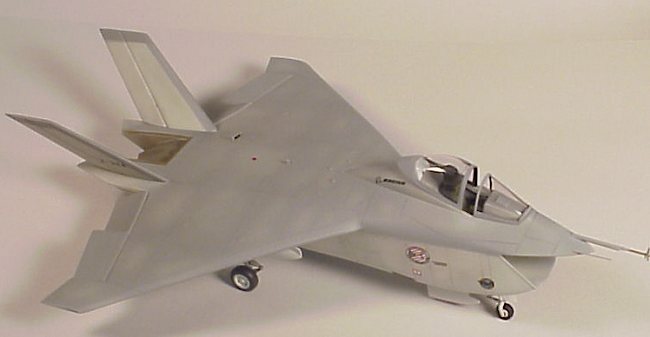 A clearly difficult area for all will be the compound air intake, it has some difficult seams to clean up way inside, and my X-32 has a nice gap way inside, so don't look. The top and bottom glue together very nice, a bit of sanding will clean up those joints. Gosh this thing is ugly. Did I mention this thing is UGLY? But it's growing on me like a 5 o'clock shadow. Yes I think I like it. The gear looks very nice painted white, as do the wheel wells, they both have some decent detailing and some black wash brings that right out. Tires are a two piece per side affair with the nose wheel being a tiny little one piece, be careful not to loose it. I had a struggle with myself as to the ejection seat that came with the kit. It looks like no seat I have ever seen before. I think this is what they call the 'generic' seat, it got the boot, and was replaced with a Verlindin Aces II seat. Ahhh, much better. But seeing as this modern jet aircraft thing is out of my league, I tended not to go into super detailing the rest of the cockpit. After a couple hours at gluing and sanding, the fun part of this build was the Painting! The Boeing website has some great reference material and I corrected some errors in the kit decal placement because of it. Colors are a hard one, one would think Light ghost gray under and dark ghost gray over. But after careful consideration and looking at all the photos on the website, I decided on Light gray under with light ghost gray over. 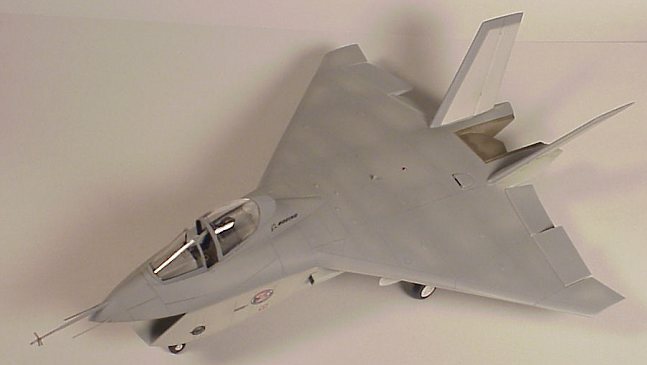 The original X-32A was pretty dirty and soiled on all panel lines so a bit of shading was in order. You'd think they'd keep this one off prototype a bit cleaner. The decals are pretty accurate, if not a bit on the oversized, but they would do the job. Future wax and Testors flat, the perfect combination. Seal those decals down good and hide the irregularities in the paint surfaces before the flat coat. Pitot tubes and probes get stuck on dead last as they would surely get lost and broken if put on sooner. The canopy is dead solid perfect and clear, even though it was scooting about in the box when I opened it. There you or I have it! 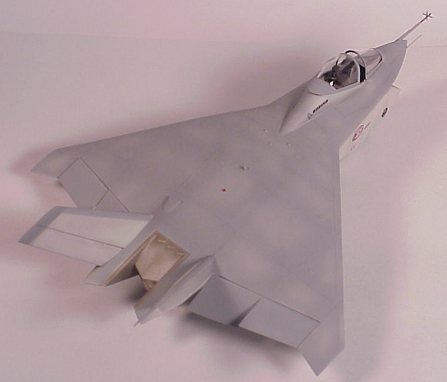 A replica of a cool looking X plane. 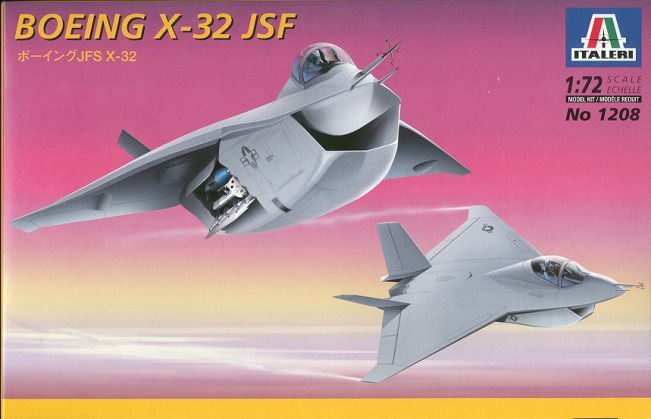 If I was the US government, and in fact I guess in some small way I am, I'd give this X the nod for production, just because it's innovative and a serious looking plane.